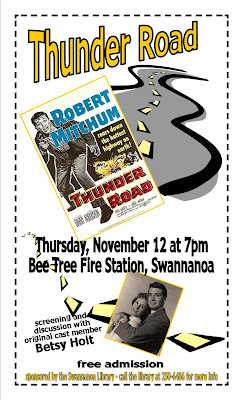 Come to a free screening of the cult classic "Thunder Road" which was filmed in Asheville and the surrounding area. Original cast member actress Betsy Holt will discuss her experiences during the production of the film. Ms. Holt played the wife of Troy Barrett, Treasury Agent (played by Gene Barry) in the 1958 film. The film will be shown at the Bee Tree Fire Station at 510 Bee Tree Road in Swannanoa. Sponsored by the Swannanoa Friends of the Library and the Friends of Buncombe County Libraries. For more information call the Swannanoa Library at 250-6486. Popcorn and drinks provided.